It appears that Eastern Ghouta is repeating the fate of Aleppo — from urban warfare tactics to Western mainstream media hysteria over the Syrian Arab Army's (SAA) operation, Sputnik contributor Andrei Kots writes. Eastern Ghouta, a rebel-held suburb of Damascus, occupies an area of about a hundred square kilometers with the pre-war population reaching 400 thousand people. The area, which is currently encircled by the SAA, was seized by the so-called Syrian opposition and radicals in 2012. Kots pointed out that four main militant groups are currently operating in the region: Hayat Tahrir ash Sham (formerly known as al-Nusra Front), the al-Rahman Legion (Faylaq al-Rahman), Ahrar al-Sham and Jaish-al-Islam. According to SAA estimates, there are 10-12 thousand militants in the region. "Militants are using residential high-rises to monitor the SAA units and adjust artillery fire," the journalist explained. "Settlements located on the borders of the territories controlled by extremists have been turned into fortified strongholds with barricades, anti-tank ditches, and well-protected firing points. The network of underground tunnels allows the militants to quickly feed reinforcements along the front line and hide from aviation and artillery shelling." The Sputnik contributor noted that the highest concentration of militants was detected in the towns of Douma, Ayn Tarma, Saqba, Al-Nashabiyah, and Harasta which are located on the highway M5, linking Damascus with Homs. However, Jobar, a municipality of the Syrian capital Damascus and the westernmost point of the territory controlled by the militants, poses the greatest challenge to the SAA. "From this bridgehead jihadists have repeatedly shelled at the Russian Embassy in Damascus with mortars," Kots remarked. "Despite the reconciliation statements by Jaish al-Islam, the mortar shelling of Damascus continues from the territory controlled by the group," Major-General Yuri Yevtushenko, head of the Russian peace and reconciliation center in Syria reported on February 26. "During the last week, 228 mines and shells were fired by militants from Eastern Ghouta at residential areas of the Syrian capital. Four people were killed; more than 50 were injured, including 16 children." On February 24 the UN Security Council adopted a resolution on a 30-day ceasefire. In addition, Russia introduced a humanitarian pause in Eastern Ghouta between 9:00 am and 2:00 pm. "At 9 am on February 27, a humanitarian corridor was opened for the release of civilians from the zone of de-escalation," Russian General Viktor Pankov reported on Tuesday, adding that jihadists did not allow civilians to flee the region. Meanwhile, the extremists are using the situation around Eastern Ghouta to their own advantage, Kots noted. "The situation in Eastern Ghouta is very similar to what happened in the autumn and winter of 2016 around Aleppo," the journalist pointed out. "Like in Eastern Ghouta, the militants of the 'moderate opposition' did not allow civilians out of the city using them as human shields, grabbing all humanitarian aid and conducting aggressive propaganda on the Internet, accusing [Syrian President Bashar] Assad and Russia of inhumane methods of warfare." Predictably, the Western media and numerous activists have quickly joined this chorus, exactly as was the case during the liberation of Aleppo, the journalist added. He referred to numerous "fake news" which have recently appeared on the Internet, starting with alleged footage of destruction in Douma, that was actually made in the Gaza Strip, and ending with the groundless claims that Russian Su-57 stealth fighters have "razed Eastern Ghouta to the ground." 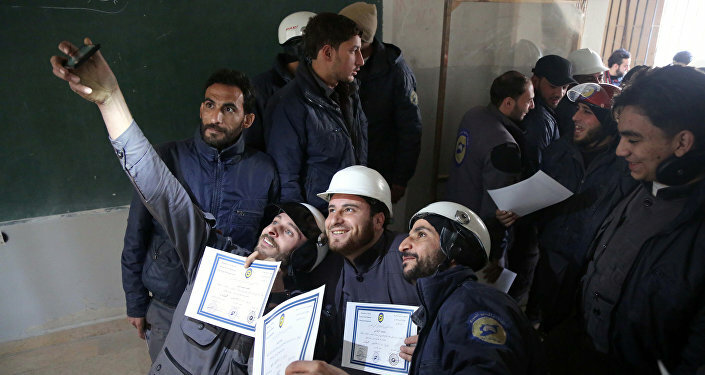 Meanwhile, the notorious White Helmets, an NGO that has been repeatedly accused of falsifying information about its operations, claimed Monday that the SAA used chlorine gas against the town of Al-Shifoniya in Eastern Ghouta, which resulted in the death of one child and the suffocation of many in the region. However, no evidence confirming the claims has been presented so far. Nevertheless, the Western media are eagerly circulating unverified information, which is spread by the militants and the infamous NGO, Kots pointed out, adding that the main objective of these media attacks is to vilify the SAA and the Russo-Syrian coalition. Addressing the High-Level Segment of the 37th Session of the Human Rights Council in Geneva, Switzerland, on Wednesday, Russian Foreign Minister Sergei Lavrov lambasted the double-standard approach exercised by the Western MSM and political figures. "We believe that dividing terrorists into the 'good' and 'bad' ones is unacceptable, especially when it is done depending on the extremists' proclaimed objectives or sources of financing," Lavrov stressed. "Russia continues to fight this vicious practice of double standards and supports the Syrian army in its move to destroy terrorism." According to Kots, the West is up in arms about the SAA making progress on the ground in Syria. However, the journalist opined that once the Syrian government forces establish control over Eastern Ghouta, the Western mass media and NATO member states will immediately lose interest in the issue. "That is exactly what happened in Aleppo," Kots recalled. "None of the Western countries sent humanitarian aid to the residents of the liberated city." The views and opinions expressed by Andrei Kots are those of the contributor and do not necessarily reflect those of Sputnik.